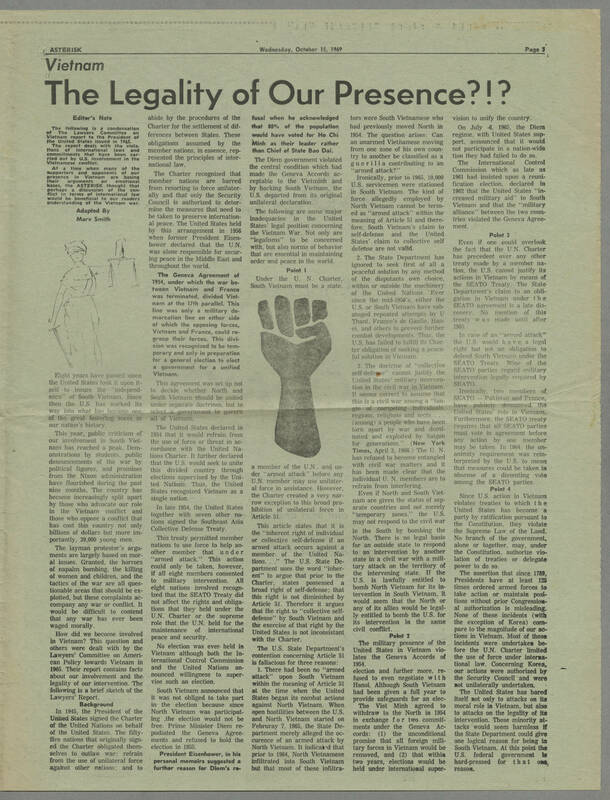 ASTERISK, Wednesday October 15, 1969 , Page 3 Vietnam The Legality of Our Presence?!? Editor's Note The following is a condensation of The Lawyers Committee on Vietnam report to the President of the United States issues in 1965. The report deals with the violations of international laws and commitments that have been carried out by U.S. involvement in the Vietnamese conflict. At a time when many of the supporters and opponents of our presence in Vietnam are basing their arguments on emotional bases, the ASTERISK thought that perhaps a discussion of the conflict in terms of international law would be beneficial to our readers understanding of the Vietnam war. Adapted BY Marv Smith Eight years have passed since the United States took it upon itself to insure the "independence" of South Vietnam. Since then the U.S. has worked its way into what has become one of the great festering sores in our nation's history. This year, public criticism of our involvement in South Vietnam has reached a peak. Demonstrations by students, public denouncements of the war by political figures and promises from the Nixon administration have flourished during the past nine months. The country has become increasingly split apart by those who advocate our role in the Vietnam conflict and those who oppose a conflict that has cost this country not only billions of dollars but more importantly, 39,000 young men. The layman protestor's arguments are largely based on moral issues. granted, the horrors of napalm bombing, the killing of women and children and the tactics of the war are all questionable areas that should be exploited, but these complaints accompany any war or conflict. It would be difficult to contend that any war has ever been waged morally. How did we become involved in Vietnam ? This question and others were dealt with by the Lawyer's Committee on American Policy towards Vietnam in 1965. Their report contains facts about our involvement and the legality of our intervention. The following is a brief sketch of the Lawyer's Report. Background In 1945 the President of the United States signed the Charter of the United Nations on behalf of the United States. The fifty five nations that originally signed the Charter obligated themselves to outlaw war; refrain from the use of unilateral force against other nations; and to abide by the procedures of the Charter for the settlement of differences between States. These obligations assumed by the member nations, in essence, represented the principles of international law. The Charter recognized that member nations are barred from resorting to force unilaterally and that only the Security Council is authorized to determine the measures that need to be taken to preserve international peace. The United States held by this arrangement in 1956 when former President Eisenhower declared that the U.N. was alone responsible for securing peace in the Middle East and throughout the world. The Geneva Agreement of 1954, under which the war between Vietnam and France was terminated, divided Vietnam at the 17th parallel. This line was only a military demarcation line on either side of which the opposing forces, Vietnam and France would regroup their forces. This division was recognized to be temporary and only in preparation for a general election to elect a government for a unified Vietnam. This agreement was set up not to decide whether North and South Vietnam should be united under separate doctrines, but to select a government to govern all of Vietnam. The United States declared in 1954 that it would refrain from the use of force or that in accordance with the United Nations Charter. It further declared that the U.S. would seek to unite this divided country through elections supervised by the United Nations. Thus, the United States recognized Vietnam as a single nation. In late 1954, the United States together with seven other nations signed the Southeast Asia Collective Defense Treaty. This treaty permitted member nations to use force to help another member that under "armed attack". This action could only be taken, however, if all eight members consented to military intervention. All eight nations involved recognized that the SEATO Treaty did not affect the rights and obligations that they held under the U.N. Charter or the supreme role that U.N. held for the maintenance of international peace and security. No election was ever held in Vietnam although both the International Control Commission and the United Nations announced willingness to supervise such an election. South Vietnam announced that it was not obliged to take part in the election because since North Vietnam was participating the election would not be free. Prime Minister Diem repudiated the Geneva Agreements and refused to hold the election in 1955. President Eisenhower, in his personal memoirs suggested a further reason for Diem's refusal when he acknowledged that 80% of the population would have voted for Ho Chi Minh as their leader rather than Chief of State Bao Dai. The Diem government violated the central condition which had made the Geneva Accords acceptable to the Vietminh and by backing South Vietnam the U.S. departed from its original unilateral declaration. The following are some major inadequacies in the United States legal position concerning the Vietnam War. Not only are "legalisms" to be concerned with, but also norms of behavior that are essential in maintaining order and peace in the world. Point I Under the U.N. Charter South Vietnam must be a state, a member of the U.N. and under "armed attack" before any U.N. member may use unilateral force in assistance. However, the Charter created a vert narrow exception to this broad prohibition of unilateral force in Article 51. This article states that it is the "inherent" right of individual or collective self defense if an armed attack occurs against a member of the United Nations..." The U.S. State Department uses the world "inherent" to argue that prior to the Charter, states possessed a broad right of self defense; that this right is not diminished by Article 51. Therefore, it argues that the right to "collective self defense" by South Vietnam and the exercise of that right by the United States is not inconsistant with the Charter. The U.S. State Department's contention concerning Article 51 is fallacious for three reasons. 1. There has been no "armed attack" upon South Vietnam within the meeting of Article 51 at the time when the United States began its combat actions against North Vietnam. When open hostilities between the U.S. and North Vietnam started on February 7, 1965, the State Department merely alleged the occurrence of an armed attack by North Vietnam. It indicated that prior to 1964, North Vietnamese infiltrated into South Vietnam but that most of these infiltrators were South Vietnamese who had previously moved North in 1954. The question arises: Can an unarmed Vietnamese moving from one zone of his own country to another be classified as a guerilla a contributing to an "armed attack?" Ironically, prior to 1965, 10,000 U.S. servicemen were stationed in South Vietnam. The kind of force allegedly employed by North Vietnam cannot be termed as "armed attack" within the meaning of Article 51 and therefore, South Vietnam;s claim to self defense and the United States claim to collective self defense are not valid. 2. The State Department has ignored to seek first of all a peaceful solution by any method of the disputants own choice, within or outside the machinery of the United Nations. Ever since the mid 1950s either the U.S. or South Vietnam have sabotaged repeated attempts by U Thant France's de Gaulle, Hanoi, and others to prevent further combat developments. Thus, the U.S. has failed to fulfill its Charter obligation of seeking a peaceful solution in Vietnam. 3. The doctrine of "collective self defense" cannot justify the United States military intervention in the civil war in Vietnam. It seems correct to assume that this is a civil war among a "tangle of competing individuals, regions, religions and sects... (among) a people who have been torn apart by war and dominated and exploited by Saigon for generations." New York Times, April 3, 1966. The U.N has refused to become entangled with Civil war matters and it has been made clear that the individual U.N. members are to refrain from interfering. Even if North and South Vietnam are given the status of separate countries and not merely "temporary zones." the U.S. may not respond to the civil war. In the South by bombing the North. There is no legal basis for an outside state to respond to an intervention by another state in a civil war with a military attack on the territory of the intervening state. If the U.S. is lawfully entitled to bomb North Vietnam for its intervention in South Vietnam it would seem that the North of any of its allies would be legally entitled to bomb the U.S. for its intervention in the same civil conflict. Point 2 The military presence of the United States in Vietnam violates the Geneva Accords of 1954. election and further more, refused to even negotiate with Hanoi. Although South Vietnam had been given a full year to provide safeguards for an elec. The Viet Minh agreed to withdraw to the North in 1954 in exchange for two commitments under the Geneva Accords: (1) the unconditional promise that all foreign military forces in Vietnam would be removed and (2) that within two years, elections would be held under international supervision to unify the country. On July 6 1965, the Diem regime with United States support, announced that it would not participate in a nation wide tion they had failed to do so. The International Control Commission which as late as 1961 had insisted upon a reunification election, declared in 1962 that the United States "increased military aid" to South Vietnam and that the "military alliance" between the two countries violated the Geneva Agreement. Point 3 Even if one could overlook the fact that the U.N. Charter has precedent over any other treaty made by a member nation, the U.S. cannot justify its actions in Vietnam by means of the SEATO Treaty. The State Department's claim to an obligation in Vietnam under the SEATO agreement is a late discovery. No mention of this treaty was made until after 1965. In case of an "armed attack" the U.S. would have a legal right but not an obligation to defend South Vietnam under the SEATO Treaty. None of the SEATO parties regard military intervention legally required by SEATO. Ironically, two members of SEATO - Pakistan and France, have publicly denounced the United States role in Vietnam, Furthermore, the SEATO treaty requires that all SEATO parties must vote in agreement before any action by one member may be taken. In 1964 the unanimity requirement was reinterpreted by the U.S. to mean that measures could be taken in absence of a dissenting vote among the SEATO parties. Point 4 Since U.S. action in Vietnam violated treaties to which the United States has become a party by ratification pursuant to the Constitution, they violate the Supreme Law of the Land. No branch of the government, alone or together, may under the Constitution, authorize violation of treaties or delegate power to do so. The assertion that since 1789, Presidents have at least 125 times ordered armed forces to take action or maintain positions without prior Congressional authorization is misleading. None of these incidents (with the exception of Korea) compare to the magnitude of our actions in Vietnam. Most of these incidents were undertaken before the U.N. Charter limited the use of force under International law. Concerning Korea, our actions were authorized by the Security Council and were not unilaterally undertaken. The united States has barred itself not only to attacks on its moral role in Vietnam but also to attacks on the legality of its intervention. These minority attacks would seem harmless if the State Department could give one logical reason for being in South Vietnam. At this point the U.S. federal government is hard pressed for that one reason.